What did the Brits do for us? Just a couple of months after the visit of the Duke and the Duchess of Cambridge, what do we still remember of their tour? With hindsight, what are the lasting effects, what are the enduring messages, what are the traces they left behind? If you remember anything at all, it would probably be images of the Royal couple engaged in touristy activities such as white-water rafting or wine tasting. You may perhaps recall Prince George’s play date with a specially assembled Plunkett Group. Perhaps the only thing you remember was the bad Wellington weather that accompanied much of the tour. In essence, the visit’s programme was such that it could have been undertaken by any kind of global celebrity, not just the heir to the British throne. To be clear, the images from the Royal tour, distributed to a global audience, were marketing gold for New Zealand tourism. But was that all we should have expected? The question should be allowed what their visit really meant for us here. Unfortunately, it did not leave a much clearer idea what is special about New Zealand’s connection with the UK. And it did not explain why our British heritage is not just something that is fundamental to an understanding of the past but maybe also relevant to shaping our future. There is something that is undoubtedly special about Britain. It is not just a small, rainy island in the North Atlantic. It is not just another mid-sized northern hemisphere country. In many ways, Britain has been, and still is, much more than that. Other countries may also lay claim to some socio-political developments or scientific inventions, but none other could boast to have started modernity with the same justification. It was Britain in which monarchs first had to respect the rights of the people and of parliament. Magna Carta and the Glorious Revolution paved the way towards liberal parliamentary democracy. Britain was the birthplace of the Enlightenment, which was a prerequisite of scientific discovery in the age of invention, the industrial revolution and the development of economic thinking. The Common Law, developed since the Norman invasion, had become an important tool in the promotion of a commercial society. The protection of property rights and freedom of contract were at the heart of this British version of law. Taken together, the UK made the modern world, it dominated it until around the time of the Great War, and it still wields incredible soft power to the present day. Britain’s greatness is not just a historic feature. It still makes Britain a special country today, not least because of the spread of the English language. For example, ask yourself where the world gets its news from, and a large part of the answer would be from the BBC, the Financial Times and The Economist. Other countries may produce better cars, more efficient machinery and certainly more palatable wine than but few others would be better at selling their ideas, culture and beliefs to the world. In the ranking of the Globalisation and World Cities Research Network, no other city was more connected globally than London – not even New York. Or, seen from yet another angle, for geographical and historical reasons, Britain is the only country that is a member of the Commonwealth, the EU, the UN and the UN’s Security Council. New Zealand is currently reconsidering its position and identity, as underlined by the Prime Minister’s initiative on changing the national flag. It is doing so because it senses that its future will be shaped by relationships beyond our traditional allies. That is sensible and also, to a degree, unavoidable. In the the 21st century, marked by the shift of power from west to east and from north to south, it would be ludicrous to pretend that we could just cling on to our cosier, familiar ties. Against the backdrop of this strategic reorientation, it is all the more deplorable that the Royal visit did not leave us with any ideas on the nature, the benefit and the future of New Zealand’s links to Britain. The relationship should certainly extend beyond photo opportunities for members of the Royal family. 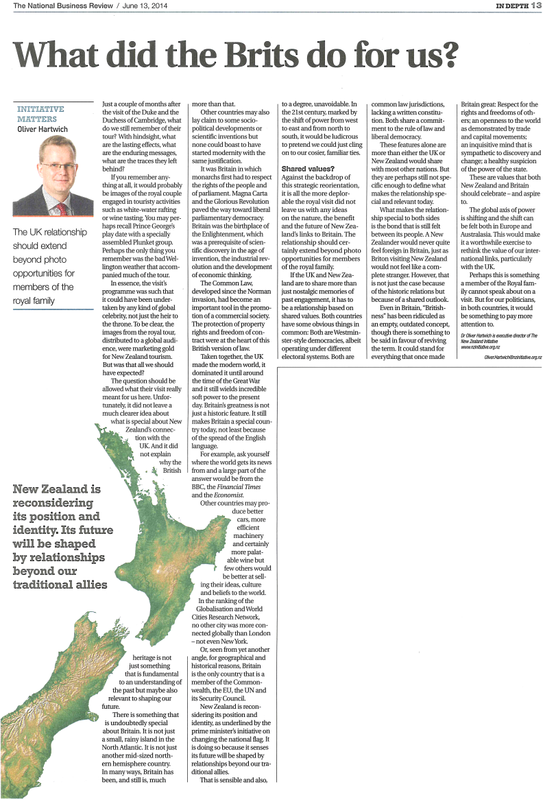 If the UK and New Zealand are to share more than just nostalgic memories of past engagement, it has to be a relationship based on shared values. Both countries have some obvious things in common: Both are Westminster-style democracies, albeit operating under different electoral systems. Both are common law jurisdictions, lacking a written constitution. Both share a commitment to the rule of law and liberal democracy. These features alone are more than either Britain or New Zealand would share with most other nations. But they are perhaps still not specific enough to define what makes the relationship special and relevant today. What makes the relationship special to both sides is the bond that is still felt between its people. A New Zealander would never quite feel foreign in Britain, just as Briton visiting New Zealand would not feel like a complete stranger. However, that is not just the case because of the historic relations but because of a shared outlook. Even in Britain, ‘Britishness’ has been ridiculed as an empty, outdated concept, though there is something to be said in favour of reviving the term. It could stand for everything that once made Britain great: Respect for the rights and freedoms of others; an openness to the world as demonstrated by trade and capital movements; an inquisitive mind that is sympathetic to discovery and change; a healthy suspicion of the power of the state. These are the values that both New Zealand and Britain should celebrate – and aspire to. The global axis of power is shifting and the shift can be felt both in Europe and Australasia. This would make it a worthwhile exercise to rethink the value of our international links, particularly with the UK. Perhaps this is something a member of the Royal family cannot speak about on a visit. But for our politicians, in both countries, it would be something to pay more attention to.